When it comes to buying a string trimmer (weed eaters), there are many factors to consider and options to choose from. Thus, selecting the right one can be harder than you think. We will look into the nuts and bolts of it in this article and, hopefully, help you select the best string trimmer for your needs. Take into consideration the state of your yard – If it doesn’t have a lot of weeds, an electric model would suffice. Uneven or rocky terrain and the presence of scrubs and thick weeds would warrant a bigger machine with more cutting power. It is also important to know which types of tasks you want to perform. If it is just trimming, then the basic models with moderate power would suffice, but if your tasks include edging, cultivating, or hedge trimming, you will need to consider a model that’s compatible with the proper attachments. Do You Need A String Trimmer? Trimming grass can be quite exhausting, especially if you’ve got a big lawn/garden or are working on a rough and uneven terrain. Bear in mind that you will have to support the entire weight of the string trimmer while you work. If you tire easily, it might be good to look into electric trimmers. Also, models with shoulder straps transfer the weight to your shoulders and torso, relieving much of the stress from your arms. Gas-powered models usually weigh between 10 and 20 lbs., while the lightest electric models weigh around 4-5 lbs. Grass trimming is not a wrestling match and it shouldn’t feel like one. Invest some time and test multiple models. See how they handle, especially if you intend to use your trimmer frequently. Things to look for here are symmetrical controls and grips, weight, balance, and maneuverability. Lighter models tend to be easier to handle while the more robust ones usually have more power. Your personal best string trimmer should not be hard to wield. Trimmers can be dangerous. It is recommended to wear goggles, protective shoes, long-sleeved shirts, and trousers. We recommend models with trigger locks which prevent the trimmers from starting on their own. It is highly advisable not to cut anything above ground level. Be careful when you’re working around trees, as pieces of tree bark could easily hit and injure you if they get under the trimmer. If you opt for a gas-powered model, you might want to consider investing in earplugs as well. Gas-powered string trimmers are the biggest and most powerful among handheld string trimmers. They have 2- or 4-stroke engines and might even sport metal blades instead of strings. 2-stroke models use oil/gas mixture while 4-stroke models run on gas. Pros include great reach, autonomy, and robustness. They can be used for heavy-duty tasks. Cons include fumes, noise, and expensive maintenance. Corded electric string trimmers need a power cord to run. They are quiet, eco-friendly, and require the least amount of maintenance. Usually, they are the lightest of the bunch. Pros include unlimited running time, virtually no maintenance between sessions, easy to start, and easy to handle and maneuver. Cons include poor mobility and light string gauges. Cordless electric string trimmers combine the mobility of the gasoline models with the eco-friendly features of the corded models. Also, they’re as quiet as the corded models. With all else equal, higher voltage batteries and motors translate to higher performance, but that’s not always the case. Pros include mobility, quiet operation, lightweight construction, easily replaceable batteries. Also, they’re low maintenance. Cons include limited battery life, expensive additional battery packs, and potentially long charging times. All trimmers, regardless of type and model, will require regular trim line replacement as well as occasional replacement of trim heads. Indoor storage is recommended for all types and models. Gas models require engine servicing from time to time and they need fuel. You will have to replace the air filters and spark plugs periodically. Also, adding fuel stabilizer would be beneficial if you’re storing your gas string trimmer for a long period of time. Empty the tank before putting it away for the winter. Corded electric string trimmers require the least maintenance, though it would be advisable to get a heavy-duty extension cord. Store them indoors in a dry and safe place. Cordless electric string trimmers typically need battery replacements every few years. Keep the battery pack indoors during winter. Make sure the batteries are fully charged before every use for the maximum runtime. Having an additional fully charged battery pack can be quite handy. There are three main categories when it comes to swath area. Models with 7”-13” swath are considered light use and are mostly intended for easier tasks and smaller lawns. 14”-16” swath is the middle class. These models might feature stronger engines/motors and thicker strings. 17”+ models are heavy duty machines. Weed eaters use a wide variety of string gauges. 0.060”-0.085” is the light category, fit for trimming grass. 0.080”-0.11” is the intermediate group, able to handle thick grass, weed, and light underbrush. Everything thicker than 0.11” is considered heavy duty. String trimmers can be single-line or double-line. Single-line models offer significantly less cutting power and often come with thin strings. Double-line units are more efficient and often feature thicker strings. Straights-shafted trimmers offer more reach and tend to have better weight distribution. They require less bending and offer better user protection. Straight-shaft models are preferred by pros and can potentially support more attachments (for edging, blowing, hedge trimming). With them, you can reach under decks, fences, and bushes. Longer shafts make them more comfortable to use over extended periods of time. Models with curved shafts use flexible cable drive to transmit the torque. Due to their compact size, occasional users might find them handy. They are generally easier to maneuver and lighter than their straight-shaft counterparts. They tend to have better balance and are best suited for tasks around sidewalks, driveways, and smaller gardens. String trimmers eat string at their own pace and, sooner or later, you’ll need to change it. Fixed spools require you to wind the new string around them. On the other hand, replaceable spools let you quickly load cartridges with wound strings. There are also fixed line head models which use short lines instead of spools. The lines on these models are inserted directly into the head. You will need to replace the line more frequently, but you will avoid the jams that regular spools are prone to. Line feed systems come in two variants – bump and feed, and demand feed. With the former, the line feeds automatically, whenever the trimmer touches the ground or is restarted. The latter requires you to press the button to initiate the action. Some trimmers, usually the gas-powered models, come with a range of accessories. Usually, these are bought separately and cater to specific tasks. Some of the most common accessories include brush cutters, pole saws, cultivators, and hedge trimmers. The DeWalt DCS920P1 is a cordless electric string trimmer with a straight shaft, simple controls, and a symmetrical grip. It has a brushless electric motor powered by a 20V battery – the standard DeWalt battery that comes with this model has a capacity of 5Ah. The line gauge is 0.080”, combined with a 13” swath. The line feed system is bump-feed. Everything points to a weed whacker that’s best for the light and intermediate tasks. The straight shaft will give you good reach and keep your back straight. Even if you’re over 6’ tall, you shouldn’t have a problem. The highlights also include a variable trigger with speed control. The economy mode runs at 4,600 rpm while power mode runs at 6,000 rpm. The DCS920P1 is on the heavier side of the cordless spectrum, coming in at 8.5lbs. There’s no harness, so the entire weight will rest on your hands. 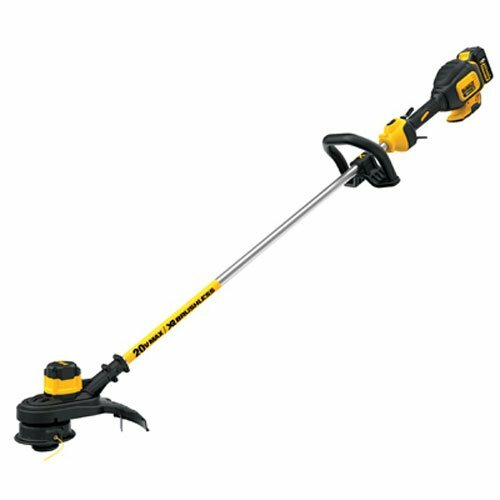 This weed eater comes in DeWalt signature yellow and black, with a polished metal shaft. The front hand grip has a rubber overgrip for better control and maneuverability. 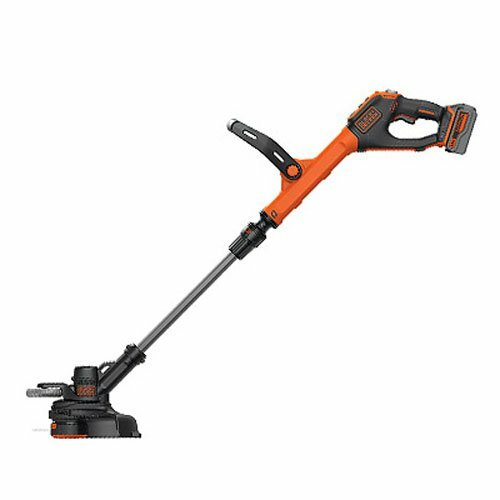 If you need a trimmer and an edger, then you might want to check the Black + Decker LSTE523. It is a 20V cordless electric string trimmer which converts from a trimmer to wheeled edger at the push of a button. It is a member of B+D’s 20V Max product family and is compatible with Powercommand tools. Straight, telescopic shaft allows for easy length adjustment and good maneuverability. This compact and cordless B+D unit is pretty light, weighing around 6.3 lbs. It delivers a cutting swath of 12”, an average range for its class. The engine has 2 modes of operation, giving the users a choice between maximum power and maximum battery life. Highlights also include Easyfeed system and Power Drive Transmission. The LSTE523 is sold in B+D’s classic orange/black color scheme, with black metal parts. Controls and front handle are symmetrical, so switching grips won’t be a problem. Our third contestant is Worx’s WG163 GT 3.0 20V Cordless Grass Trimmer/Edger. It is a 5.3 lbs. unit with a cordless, battery-powered motor. It offers a straight, telescopic shaft which tilts 90° and is super-easy to adjust. The 12” cutting radius and line diameter of only 0.065” put this one firmly into the light-use class. Cutting line is 10’ long and it has a quick-release lever for when you need to adjust the height quickly. The WG163 can also perform edging duties, as it features dual-position wheels and a rotatable head. The engine runs at 7,600 rpm and doesn’t have the battery-saving mode. The dual-function flower spacer/guard can come in handy when you’re working around flowers and areas where you have to be extra careful. Worx makes this lightweight weed eater in a smart combination of black and chrome, with orange accents. Controls are symmetrical, fit for both left- and right-hand use. The WG163 is compatible with 20V Worx Power Share tools. 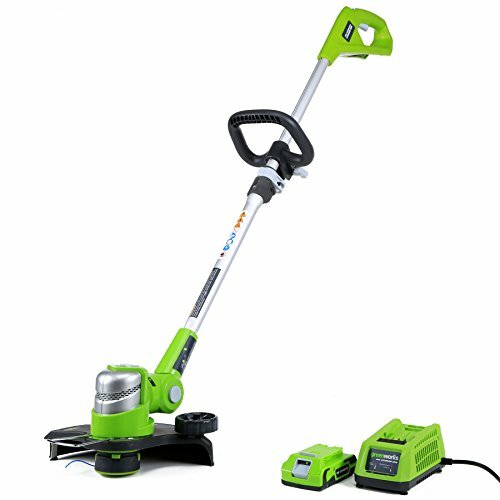 Greenworks’ 24V Cordless String Trimmer/Edger is a dual-purpose weed eater: trimming and edging. 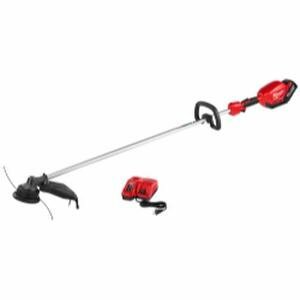 It is a cordless electric string trimmer with a straight telescopic shaft, dual-purpose guard, and a built-in wheel. The pivoting head makes it easy to switch into the edging mode. The engine is located at the bottom which might make this model a bit cumbersome to use over extended periods of time. With such bottom-heavy units, it is advisable to invest in a harness. The swath range is 12” which, combined with a thin 0.065” single-line string, gives a slightly weak performance for a 24V model. Rugged and harsh terrains should be avoided with this unit while mildly brushy ones should not pose too big of a challenge. This model is offered in Greenworx’s signature green with black plastic parts. It is simple and easy to use. The Milwaukee 2725-21HD M18 FUEL String Trimmer Kit is equipped with an 18V brushless motor and variable speed trigger. The Redlink system keeps the engine from overloading. This professional-grade weed eater operates in two modes – economy mode which runs at 4,600 rpm and power mode at 5,800 rpm. With the engine located at the top, this Milwaukee offers good balance and stability. The head is full-sized and supports 14”-16” swaths. Go with the 14” option for maximum runtime or the 16” swath for maximum cutting power. It supports string gauges from 0.080” to 0.095”, which let this weed eater take on more serious tasks. The line is fed through a bump-feed system that sports a metal-reinforced bump knob. The long battery life (up to 1h) gives the user great autonomy. The Milwaukee 2725-HD is fully compatible with all M18 batteries and chargers. It delivers abundant power and long runtime. Due to its fixed-head construction, edging and other tasks remain out of reach. But, what it lacks in versatility, it compensates for with power and reliability. 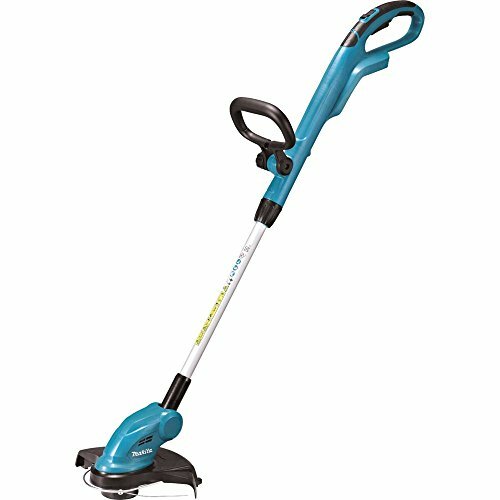 The Makita XRU02Z 18V Lithium-Ion Cordless String Trimmer is a battery-powered string trimmer with a telescopic shaft, rotatable head, and modern design. The engine is located at the bottom which, despite its somewhat low weight (6.4lbs with battery), might make it hard to use for big projects. The engine runs at 7,800rpm, with no option to slow it down to extend battery life. The head of this compact weed eater rotates 180°, allowing the users to convert this unit into an edger. Under the hood, though, Makita packs a light gauge string (0.060”) with 10-3/4“ reach. Combined with the long battery life (up to 60 minutes on a single charge), this unit can cover a lot of ground. The telescopic shaft has a range of 48-1/2” to 56-1/2”. The Makita XRU02Z uses bump-and-feed system, with a metal-reinforced bump button. Nice touches include a battery level indicator and a built-in lock-off lever. 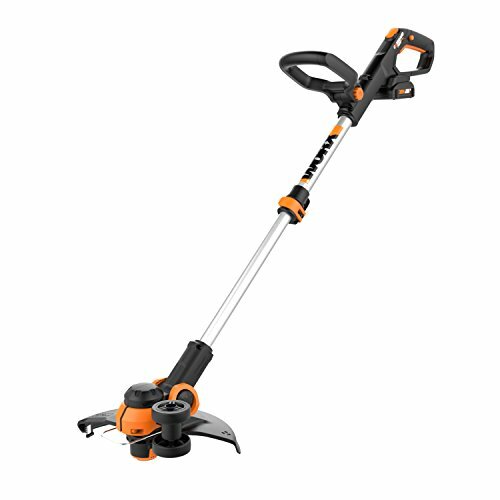 The winner of this roundup is Black + Decker LSTE523 20V Max String Trimmer/Edger. This B+D might need a spare battery if you have a big yard to trim, but it more than compensates for that with versatility, durability, and compatibility with other Powercommand tools and accessories. The cutting swath of 12” with a 0.065 string is in the same class as the Worx and Greenworx units, but shorter than the DeWalt’s 13” with 0.080” string and the Milwaukee’s 14”-16” range with 0.080”-0.095” strings. The LSTE523 also allows you to switch between power and economy modes, a feature that the Milwaukee, Makita, and Worx models lack. The telescopic shaft is very easy to manipulate and rotate, making maneuvering and transformation a breeze. Another strong point of the B+D unit is edging, a category in which it easily beats the competition. The Milwaukee and DeWalt models, on the other hand, can’t be used for edging. Hopefully, this article has put you on the right path to choosing the best string trimmer for you and your lawn.